An event to raise fund for Grain School initiative. We would like to thank all of our supporters for their generous contribution made towards the Service Vehicle Project. We now have a Service Vehicle that has made it very convenient for us to travel to distant villages within a short span of time. We are now able to carry supplies and all other necessities in just one trip. This has made the villages a lot more accessible to us. We hope to make optimum use of the Service Vehicle for all Aham Bhumika initiatives. Aham Bhumika ran it's first Summer Camp ever in the village district Bodakho in Bhopal. The 10 day summer camp ran from the 4th of April to the 18th of April 2008. We created a list of areas we wanted to train the children in. The intent was to provide the children of Bodakho an experience that would lure them into schools, the logistics however were daunting. These paintings have been created by an amateur artist in Bhopal. 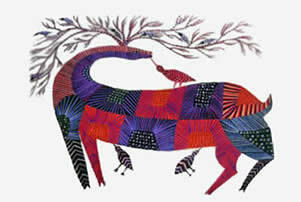 This art form is known as "Gond" concieved by the Bhil tribes of Madhya Pradesh. Mehak is now in village Borda and it caters to the needs of the children in Mahabadia as well as Borda. 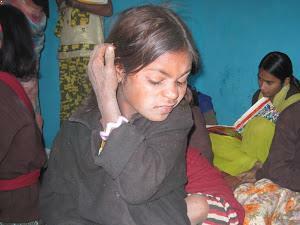 We have 120 children at Mehak out of which 77 are girls while the rest are boys. Mehak only accepted girls ealier. However from this term we have started teaching boys as well. Besides Hindi and Mathematics the children at Mehak are also being taught English, Computer basics as well as Art and Craft. Mehak classes are now run from 4.00 pm to 6.00 pm. Aham Bhumika organised a Photo Exhibition on Rural India on the 7th of March 2011. This event was organised to raise funds for the Grain School initiative. Our NGO is run by individuals who have full time jobs to support their family but also harbour passion for giving back to the society. Grain School is an initiative by Aham Bhumika to make village women self-reliant. We've been supporting village Anganwadi centers (kindergaten) by distributing clothes and books, this time we went a step further and distributed toys. Around thirty two toys were distributed to children of the village Aanganwadi centre of village Mahabadiya, Kolar Road, Bhopal (situated nearly 17 kms from the heart of the city Bhopal). Aham Bhumika ran it's first Winter Camp in the village district Mahabadia in Bhopal. The week long camp ran from the 24th to the 30th of December 2012. 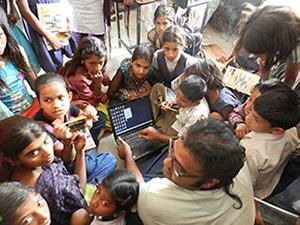 The winter camp organised by Subrat Goswami was held at the local school at Mahabadia. This is an all girl school and the age groups in the camp spanned from 4 to 18 years. We had the suppport of all the residents and teachers in Mahabadia. Aham Bhumika successfully ran its second summer camp in the village of Bokadho on the outskirts of Bhopal. The six day camp was held between the 8th and 15th of April 2013. The tribal children of the 3 primary schools of the village got an opportunity to participate in the camp. The aim behind organizing the camp was to generate an interest in art and craft, to explore the hidden talent in the kids, and raise computer literacy among the little children. 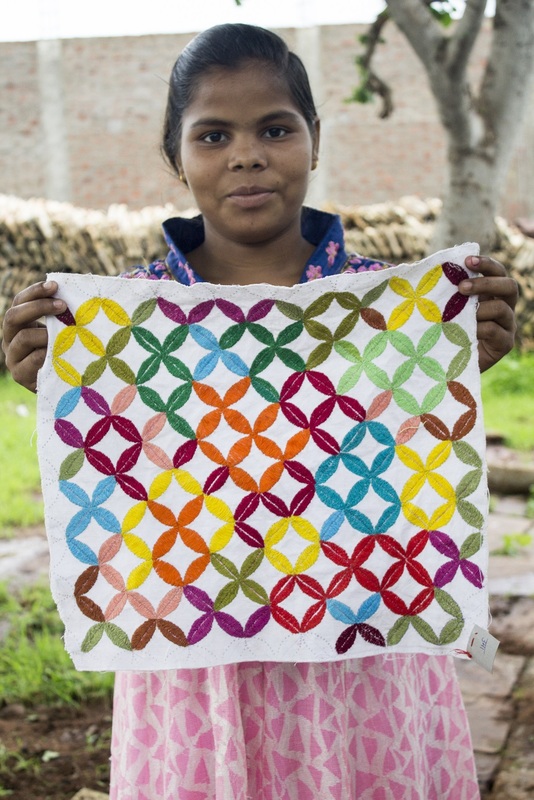 The Embroidery Project is a small yet meaningful endeavor of Ahambhumika wherein a small group of rural women and girls living on the outskirts of Bhopal are trained in hand embroidery work. 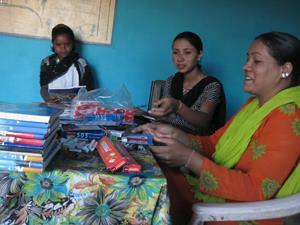 The women and girls trained belong to the lowest income stratum of the community. Currently, they are being taught to master Gond Art embroidery, which is a tribal art form of central India. Aims to turn this severely under-resourced section of the society into a self- reliant one. Kunti and Laxmi both are sister. 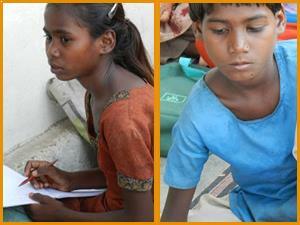 I met them last Saturday ( 02.05.12) sitting outside of our informal literacy centre in the village Mahabadia, Bhopal. I was told that they were left by their mother few days ago to a distant relative in the village on their mercy. Kunti is 12+ years old while her younger sister Laxmi is 8+years old. Their parents have 6 children (4 girl and 2 son).Father who is a regular drunkard beats her wife and children regularly without any reason like every useless Indian who used to show their muscle power to the woman. Little did I know it would end up being the experience that it was! We got a feel of the terrain a day before the camp. The first sight that greeted us was of children carrying water on their little heads. With daily media reports on Indian economy leaping with a net growth of 8% GDP every year, one is bound to feel good that our country is on the path to peace, harmony and progress. So many graduates are moving to big cities to find lucrative jobs in ever-expanding Indian market. Big international companies are setting their plant on Indian land bringing money and employment both in India. 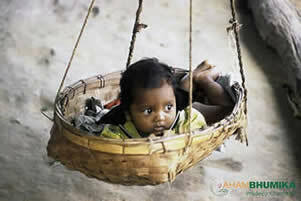 Despite all these reports, we often ignore the plight of poor which still constitutes a major chunk of our population. Jawaharlal Nehru had once said-"Educate a man and you educate one person. Educate a woman and you educate the whole family." Female Education in India is not a gift of modern civilization. In olden days women excelled in the sphere of education and hence the goddess of learning was conceived of as a female who was popularly known as "Saraswati". The traditional value of girl education in India was to enable her to be more competent in running the household, especially motherhood and to be able to give children a better upbringing. These are the photographs of "Mahak" ( Flavour).An education centre started by us for the girl child of stone crushers of a village namely Mahabadia near Bhopal. These girl child have never been to school and they look after the household work after their parents are off to the field. We are providing them initially basic education of reading and writing Hindi and Artihmetic.These education centre started functioning from 11.12.2011.We also intend to add some interesting activities like doll making,art and craft etc.shortly. 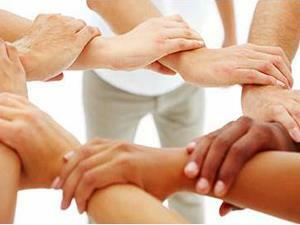 There are many pre-conceived notions related to volunteering and social networking among us. We think that volunteering can be only done by going to the NGO. But volunteering goes beyond our physical presence. Commitment has no boundaries. We think that Social networking is just for sharing photos that we took from our recent Goa trip. But a person named Shawn Ahmed (he goes by the handle @uncultured on twitter) creates awareness and funds through social media and recently, due to his efforts he was invited to Davos. We are not funded by the government or any big organizations. We are supported by individual donations from people all across India. We need your support to bring change to the lives of people in rural India. We require Computers (Desktop/ Laptops) preferably old but in working condition. We'll need the computers with installed Operating System and other general softwares like MS office etc. Aham Bhumika launches the "Donate a Bi-Cycle Campaign". A bicycle can help transform the life of a student who would otherwise skip school to avoid travelling across villages. Rural India is still deprived of bare necessities and one of them is Clothes. The cloth Bank initiative was started to ensure that children and adults have a steady flow of clothing. There are many pre-conceived notions related to volunteering and social networking among us. We think that volunteering can be only done by going to the NGO. Thanks to WorkshopQ for their support this festive season! Ahambhumika works in two adjoining villages: Borda and Mahabadia, situated on the outskirts of Bhopal. When we started, we found that the adolescent girl children of these villages had no access to any art and craft orother recreational activity through which they could develop and show case their talent. To involve the girls in recreational activities and give expression to their creativity, we started craft based activities with the support of our volunteers through weekend classes every Saturday and Sunday. We began by teaching them crochet work. Thereafter we started imparting them training in hand embroidery. 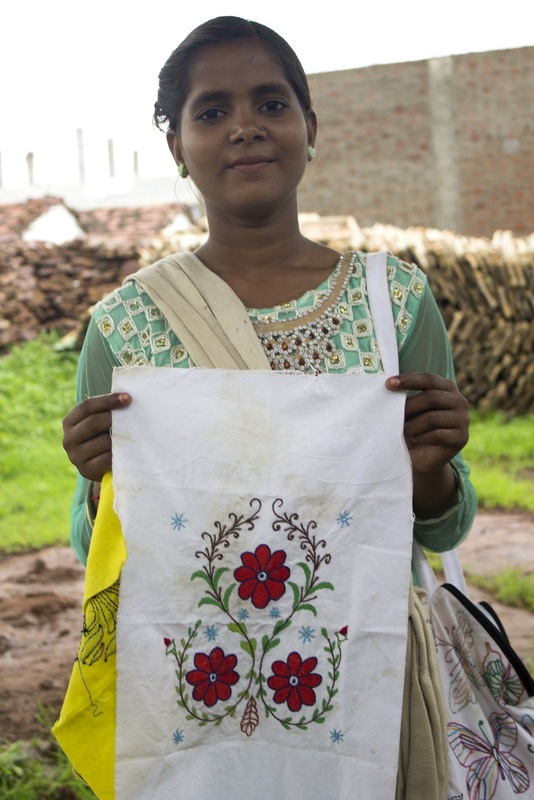 The girls took immense interest and they learnt the basics of hand embroidery quickly. The surplus work is gifted to volunteers and supporters when they visit our centre. We are delighted to announce that we have more than 30 girls who attend our week end craft classes with joy and are proud of what they are learning. As Pooja one of them says, "We enjoys doing craft activity during every week ends in our craft centre.Earlier we do not have anything like that and we used to spent time ideally during week ends but now we enjoys learning the activity under the guidance of the didi.Some time people from various parts of country also visit our centre and they appreciate what we have learnt and learning." As we are changing our systems to comply with the GST changes, we request you to be patient and check back in a while. As of now, we have stopped accepting orders for a period of 15 days.